Stems: Erect to ascending or sometimes prostrate, 1 to few, robust, solid or hollow, often branched above, pubescent with ax-shaped hairs or glabrous. Leaves: Alternate, odd-pinnately compound, 2 to 14 inches long, short-stalked to sessile; stipules united, triangular, tapering-pointed, 1/8 to 3/4 inch long; leaflets 13-35, narrowly lanceolate to oblong, ovate, or elliptic, 2/5 to 1.6 inch long, 1/6 to 3/5inch wide; under surface with ax-shaped hairs; margins entire, tip rounded; base rounded or pointed. Inflorescences: Raceme, dense, many-flowered, 1 to 8 inches long, terminal on stalks from leaf axils; stalks stiffly-upright; flowers bent downward, overlapping. Fruits: Pods, numerous, ascending or erect, short-cylindrical to ellipsoid, 2/5 to 3/5 inch long excluding beak, 1/5 to 1/4 inch wide, glabrous or rarely fine-hairy; seeds heart- to kidney-shaped, about 1/12 inch long, smooth, brown. Habitat: Open woods, stream and river banks, moist prairies, roadsides, rocky or sandy thickets. Uses: Native Americans applied a poultice of chewed roots to cuts and chewed the roots for chest and back pains; steeped the roots and used the tea to treat fevers and coughs; ate the roots fresh or boiled; and used the whole plant as a mat between freshly butchered meat and the ground. Small boys would use the stalks of pods as rattles in imitation of ceremonial dances. Comments: Canada milk-vetch often forms patches. "Milk-vetch" is an Old English name alluding to the belief that goats increased milk production after consuming these plants. 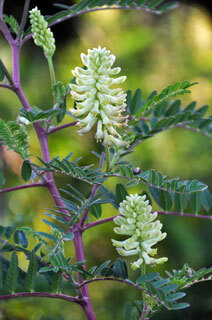 Old French Veche, a corruption of Latin vicia, a name used to refer to plants of the Bean Family that have tendrils.